Bridge languages played an important role in history and continue to thrive in today's world of global trade. From lingua franca, an entire sub-culture, and in some cases, a culture is born. 'Singlish' for example is very much a part of today's Singaporean culture, although it started off out of necessity. We take a look at another well-known culture in Africa to explore how bridge languages develop and give birth to new cultures. Singlish in Singapore is spoken widely and has become a popular form of everyday communication. The eastern coast of Africa has been of huge strategic interest for various explorers and traders for thousands of years. Generally referred to as the Swahili Coast, it is a region that geographically covers a small coastal part of Mozambique plus the entire Kenyan and Tanzanian coastline. Essentially, it has been the main cultural and commercial hub between East Africa and the outside world, more so the Indian and Pacific ocean powers and in later centuries, the European powers. This means almost every major sea faring civilisation in the middle east, the far east and some European powers, have at some point had some contact with the Eastern coast of Africa - these include; the Chinese, Persians, Indians, Portuguese, Arabs, Germans and the British. As a strategic trading post, the Swahili coast was a launching pad to access the African interior and thus a vibrant international trade was born. Foreign traders would access such things as gold, spices, ivory, skins, wax and slaves, and in exchange they would bring glassware, silk, cotton and ceramics. An emperor from the Ming Dynasty receiving a giraffe in his court. As for trade with the Far East, particularly with China, the Swahili coast achieved the greatest trading success under the Ming dynasty. As a matter of fact, the Chinese traders brought a giraffe to the emperor’s court. As early as the 2nd Century, Omani Arab merchants who regularly made journeys between East Africa and Oman, started speaking this new dialect which was a result of a mixture between the Bantu language and the Arabic language, with a few loan words from Persian. Such was the vibrancy of the trade that due to intensive commercial exchange, a new lingua franca was born to facilitate easier communication between Arabs and Africans. This marked the birth of Swahili language - one the most spoken languages in Africa as well as one of the most commonly spoken Bantu language. It also carries the distinction of being the most taught African language in the world. This new lingua franca would grow in influence with the adoption of Islam among the Africans and also with the rise of intermarriages between the Arabs and the Africans. In present day it is largely spoken in Kenya, Uganda, Rwanda, Burundi, Democratic Republic of Congo, Malawi, Mozambique, Comoros Island and parts of the Central African Republic. Over the next centuries, the Swahili language diversified to incorporate Portuguese words upon establishing their rule in 15th Century. The same trend would continue with British and German colonisation where you will find a few English and German loan words. Relations between Arab-Persian migrants and the Bantu indigenous population were sufficiently peaceful and developed in to flourishing commercial activity, however with the arrival of the British in the late 19th century, it saw the fall of various Omani sultanates and the slave trade along with it. The scramble and partition of Africa in turn led to the establishment of protectorates as envisioned in the Berlin conference leading to the colonisation of Africa and ultimately ending Omani sultanate rule in East Africa. After independence, the administration of the Swahili coast subsequently fell into the newly independent states of Kenya and Tanzania. 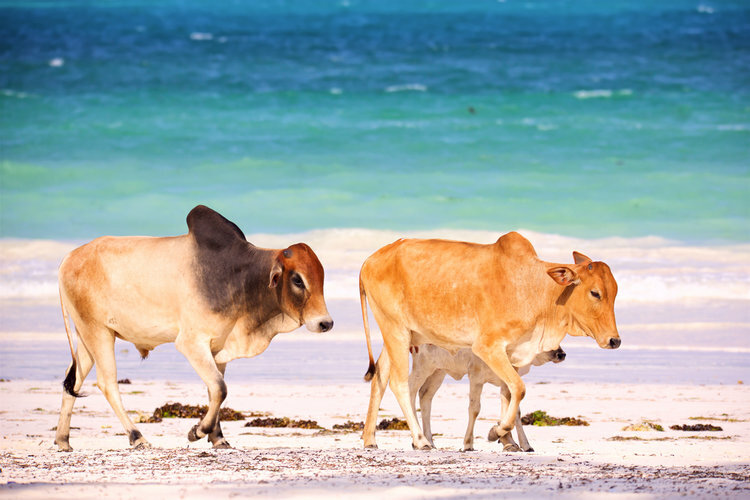 Brown humped cows in Zanzibar. A modern reminder of trade between Africa and Western Asia which lead to a lingua franca. Today, much of the racial constitution of the population along the Swahili coast has not changed. With a population made up of peoples largely of Bantu origin as well as a visible Arab and Afro-Arab population. Today the term Swahili culture (Uswahili in Kiswahili) designates culture shared by the people of the East African coast. The term comes from the plural of the Arabic word sahel ساحل: sawahil سواحل which means coast or border and these cities possess a unique architecture that weaves a unique mix of Arabic design with an African flair. Predictably, the intensive trade led to the development of major coastal city states which included; Mombasa, Malindi, Comoros, Lamu, the Archipelagos of Zanzibar and the Kilwa Sultanate. Written by Charles Njorge, Lexigo: Hailing from France, Charles is a professional multilingual translator fluent in English, French and Swahili. His eye for detail, love of arts and education in political science is reflected in his writing which highlights and explores different cultures, customs and languages. Persian gardens. Yes, you read right. What are they and where to find them. Lexigo is a leading cloud-based translation, localisation and multicultural communication agency for business, enterprise and government - enabling organisations to communicate with confidence and boost time-to-market in 96 languages.